I set out for this week’s first training walk on Monday morning planning to trek for 18-20km. However I soon became aware of a groin strain which was proving quite uncomfortable. I kept going hoping that the discomfort would subside, but after about 7km I decided it would be better to change my plans before I reached the point of no return, so I took a very steep path down into the Canillas valley and then back up the other side, finally chalking up a walk of 10km. I realised during the walk that the strain was due to my leg being jolted whilst out riding a couple of days earlier. So I set out on Tuesday to take the route I had planned the previous day, this time without any discomfort. 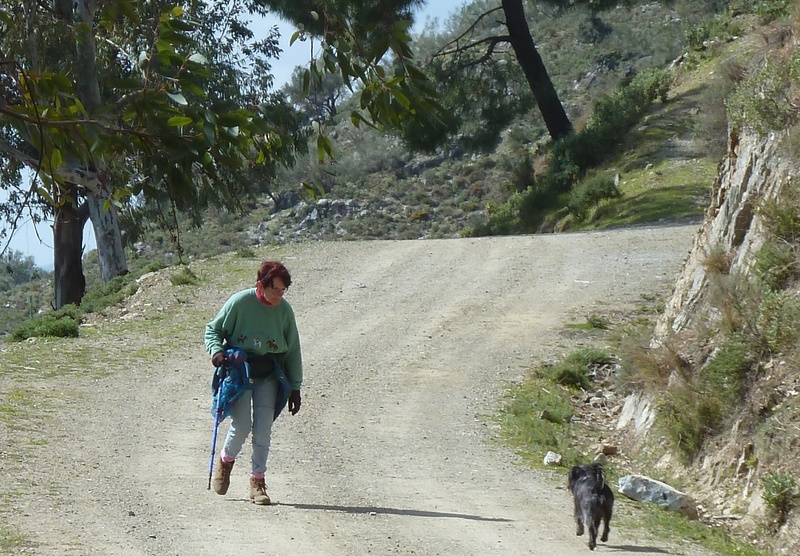 It is a walk with many steep hills and descents, about 30:70 tarmac road to rough track, which I think approximates the terrain I can expect to find on the camino. It is an interesting walk which I can make longer or shorter depending on my plans for the day, with varying views and temperatures from different sides of the mountain. This fairly circular route will be my standard training trek which, in its longest form, is 19km. Although I will be walking on average 25-30km each day on the camino, I think that this route is sufficient for practise purposes in order to build up stamina and strength. I contact my very good friend Helen who lives between the villages of Salares and Sedella to suggest that I walk over to see her and we decide that it will have to be the following day as the rest of the week promises rain. So for the third day running I set out on what will be my longest trek yet. I have traced the walk on my ipad app ‘route mapper’ which allows me to plot my route by running my finger along the roads and tracks that I plan to walk (literally letting my fingers do the walking). The app uses google earth images and indicates distance travelled. I have checked the distance stated by this app against the car milometer and as they match up, I feel confident that it is telling me the truth. Shortly after setting out on a very chilly morning, with hands and ears well wrapped, I pass an area of the road that is always wet due to an escape of underground water. The road surface looks odd and I walk over to investigate, only to discover to my peril that I have stepped onto a sheet of ice and before I know it I am very unceremoniously dumped on my backside and feeling rather stupid (and a little bruised). The dog let out a scream and scarpered out of harm’s way in case I landed on top of him. I have noticed a few times that if I trip or stumble he gets out of the way very quickly. A straightforward case of self preservation. As no damage has been done – except to my pride – I continue my walk and make my way up to the top track that I walked in the rain with Lyn last week. Again I see much evidence of wild boar, and more horse droppings than can possibly have been left by domestic animals. 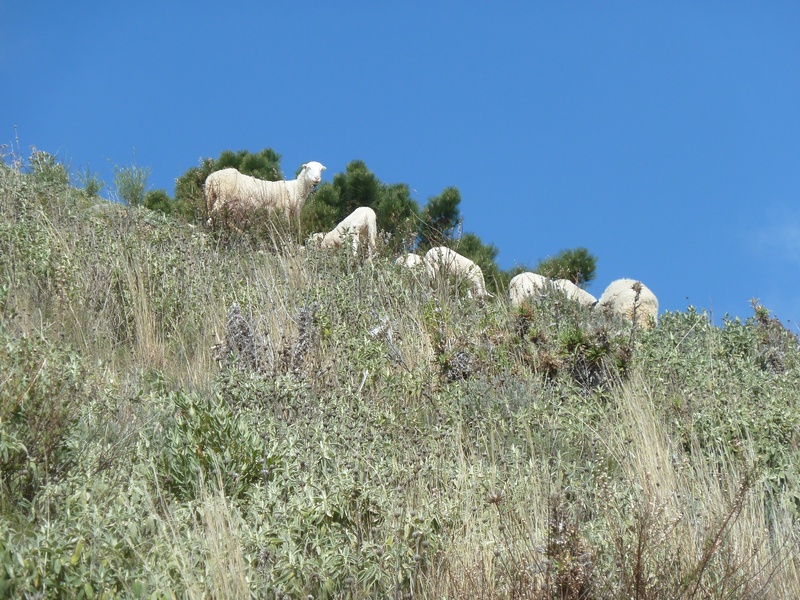 There is a group of three properties and a small plateau of cultivated farm land in a very remote area, quite high in the mountain, that looks very out of place in this rugged area. I hear some bells high above and look up to see a small group of sheep looking down at us, although after a difficult incline we are soon on the same level, at which point they decide to run away from us (unfortunately in the same direction that we are taking) and Roly decides that this is a good game and sets off to run after them. Luckily he hesitates when I call to him and I get the chance to put on his lead to put an end to his antics. The sudden drop in temperature once we reach the high track is a bit of a shock, but at least this track is now level for about 8km and the surrounding terrain is very rugged but stunning, with many water courses running down the mountain above us and on down into the river at the bottom of the valley, very far below. As we round a bend I finally come across some horses, a young foal, probably about a year old, on the track and two grey adults above us in the trees. 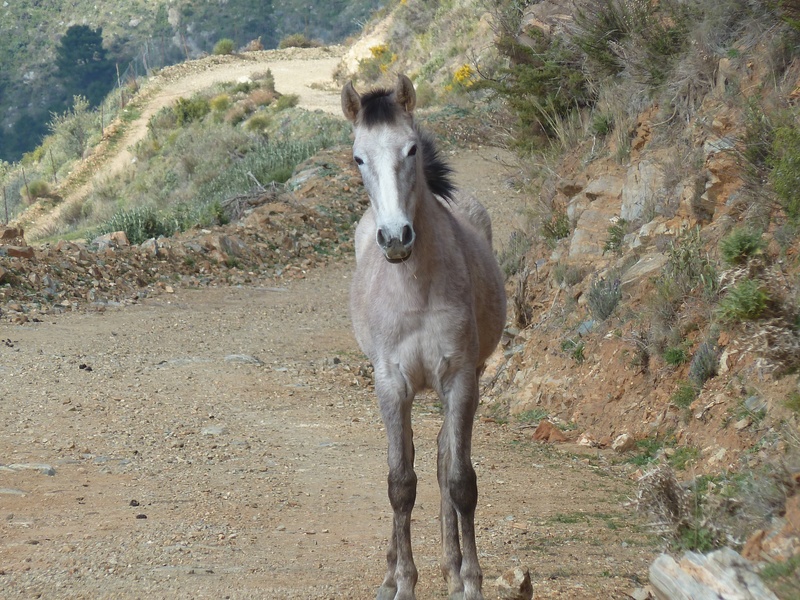 None of them seem too purturbed by our presence, although as we get closer the foal turns and ambles up a trail towards the others. I finally reach the point where the track divides with the option to walk back towards Canillas (via Fogarate) as I did with Lyn last week, or to continue towards Salares which is my intention. I phone Helen to give her a indication of my ETA and she tells me that she is walking up the mountain to meet me. I suspected she might do this and am delighted that I will have some human company for the last leg of my trek. I know this track very well because I have ridden it many times with Helen during the three years that I kept Liana at her stable. I see a group of walkers in front of me, the first people I have seen for many hours. I see Helen in the distance and Roly rushes to meet her. As we walk down the hill towards the village Helen tells me that she is worried about her horse Gretel, who seems to be in some pain. The vet had already visited but was returning a couple of days later with x-ray equipment to enable a diagnosis. Gretel and Liana were great chums and were together permanently for three and a half years. We worried that they would both be very stressed when we separated them, but in the event they both coped well and Liana settled into her new life at home with us and Gretel had a new friend when Helen adopted a small pony from a horse shelter. Blossom is a very pretty, inquisitive, one eyed pony who had her badly infected eye removed at the shelter. I have arranged that David will meet us for a bite to eat with our friend Theo who runs a tiny bar in Salares, and we eat a bowl of hearty soup before driving to Helen’s house for a slice of her fabulous lemon tart and a cup of coffee. I was hoping that the walk would be 25km, but because we stopped off in the village it was only 23km, and having stopped for lunch, I was not in the right frame of mind to carry on and walk to Helen’s. Although this is my longest walk yet, I still have to break the 25km barrier. Love your writing Maggie. Laurie lee would be proud. he will be even prouder when you compleat the camino de santiago.